This page is dedicated in memory of the courageous North Carolina State Troopers who made the ultimate sacrifice by giving their lives in the line-of-duty. The Memorial site is located at the entrance of the North Carolina State Highway Patrol Training Center at 3318 Garner Road in Raleigh. The public may visit the site during the hours of 9 a.m. to 4 p.m., Monday through Friday. Patrolman G. I. Thompson - Anson County - Killed July 2, 1929, in a motorcycle accident. Patrolman A. J. Hedgpeth - Richmond County - Killed October 23, 1931, in a motorcycle accident. Patrolman A. S. Boney - Duplin County - Killed November 15, 1931, in a motorcycle accident. Patrolman C. L. Fidler - Davidson County - Killed March 20, 1936, in a motorcycle accident. Patrolman R. W. Arnold - Halifax County - Killed September 17, 1936, in a motorcycle accident. Patrolman I. T. Moore - Wayne County - Killed June 18, 1937, from gunshot wounds inflicted while questioning two suspects, concerning 500 pounds of meat in the rear of their vehicle (later confirmed as stolen). Patrolman G. C. Penn - Buncombe County - Killed August 22, 1937, from gunshot wounds inflicted by two escaped felons operating a stolen vehicle. Patrolman A. B. Smart - Catawba County - Killed March 2, 1939, in a traffic accident. Patrolman H. T. Timberlake - Cumberland County - Killed December 1, 1939, in a traffic accident. Patrolman T. B. Whatley - Graham County - Died December 29, 1947, during surgery as a result of a gunshot wound received while attempting to serve a peace warrant with a fellow officer. Patrolman W. H. Hogan - Wytheville, Virginia (Assigned to Alleghany County) - Died March 1, 1948, of injuries received when his vehicle was forced into a bridge abutment while pursuing a liquor-laden vehicle. Patrolman J. R. Davis - Cherokee County - Killed May 3, 1948, in an airplane crash. Patrolman C. E. Galloway - Cherokee County - Killed May 3, 1948, in an airplane crash. Patrolman P. W. Smith - Stanley County - Drowned May 27, 1948, after the hood of his patrol car came open causing him to run off the road and overturn in a water-filled ditch. Patrolman R. W. Jackson - Carteret County - Died September 3, 1949, in a pursuit related traffic accident. Patrolman C. B. Avent - Nash County - Died December 12, 1949, of injuries received when struck by a vehicle while conducting a light checking station. Patrolman W. L. Reece - Richmond County - Killed November 5, 1957, from a gunshot wound inflicted by a mental institution escapee after stopping a vehicle for a speeding violation. Patrolman J. T. Brown - Lee County - Died November 5, 1957, during surgery after receiving a gunshot wound inflicted by Patrolman W. L. Reece's murderer after stopping a suspicious vehicle. Patrolman H. T. Long - Harnett County - Died on December 18, 1959, after being struck by a drunken driver on December 17, 1959 while making a routine traffic stop. Patrolman D. B. Searcy - Catawba County - Died October 15, 1960, after his vehicle was struck from the rear by a tractor trailer while he was assisting another patrolman. Patrolman H. A. Hight- Moore County - Killed May 31, 1962, in a traffic accident. Patrolman L. E. Pace - Guilford County - Killed January 24, 1963, in a pursuit related traffic accident. Patrolman W. T. Herbin- Hoke County - Killed August 31, 1964, by gunshot wounds inflicted by the driver of a vehicle he had stopped for questioning. Patrolman J. H. Marshburn - Robeson County - Killed September 19, 1964, by gunshot wounds after stopping two pedestrians for questioning near a burned vehicle. Patrolman J. W. Wallin - Avery County - Killed April 1, 1966, in a pursuit related traffic accident. Patrolman C. H. Hoffman - Iredell County - Killed March 15, 1968, in a pursuit related traffic accident. Motor Carrier Officer Robert J. Furmage, Jr. - Robeson County, Killed January 02, 1970, while weighing a commercial vehicle. Patrolman P. J. Williams - Pamlico County - Killed November 8, 1970, in a pursuit related traffic accident. Patrolman C. S. Perry - Polk County - Killed July 2, 1972, in a pursuit related traffic accident. Patrolman J. G. Wright- Person County - Killed on September 27, 1972, from gunshot wounds sustained when he stopped a vehicle occupied by three men wanted in a robbery. Patrolman L. T. Walton - Robeson County - Killed December 2, 1972, from gunshot wounds inflicted by the occupants of a vehicle he had stopped for speeding. Patrolman R. R. East - Wake County - Killed December 21, 1972, in a pursuit related traffic accident. Patrolman L. Meeks, Jr. - Chatham County - Died December 25, 1972, while responding to "officer needs assistance" call when his patrol car skidded off the road and struck a tree. Patrolman W. J. Smith - Carteret County - Killed January 12, 1974, in a pursuit related traffic accident. First Sergeant J. S. Hackett - Rockingham County - Killed June 19, 1974, in a helicopter crash. Patrolman J. A. Parker - Rockingham County - Killed June 19, 1974, in a helicopter crash. Patrolman J. D. Templeton - Guilford County - Died September 30, 1974, of traffic accident injuries received on July 11, 1974 while pursuing a fugitive who had kidnapped three nurses. Sergeant W. D. Arledge - Buncombe County - Died October 5, 1974, as a result of a gunshot wound inflicted by a drunken driving suspect while administering a breathalyzer test. Patrolman L. Canipe, Jr. - Buncombe County - Died October 5, 1974, as a result of a gunshot wound inflicted by a drunken driving suspect while administering a breathalyzer test. Patrolman G. T. Davis, Jr. - Martin County - Died September 2, 1975, as a result of a gunshot wound received when he stopped a vehicle for a traffic violation whose occupants had just robbed a bank. Patrolman H. R. Griffin - Pender County - Died September 14, 1975, as a result of gunshot wounds received when he stopped a vehicle for speeding whose occupants were wanted for murder. Patrolman R. L. Peterson - Rutherford County - Died May 31, 1979, as a result of a gunshot wound received while pursuing a man for speeding who minutes earlier had murdered two county deputies. Trooper G. A. Harmon - Haywood County - Died April 9, 1985, as a result of gunshot wounds inflicted by the driver of a vehicle he had stopped for speeding. Trooper R. E. Worley - Halifax County - Died May 14, 1985, as a result of gunshot wounds inflicted by the occupants of two stolen vans whom he had stopped for speeding. Trooper B. L. Coggins - Madison County - Died September 14, 1985, as a result of gunshot wounds received after stopping a vehicle which had been stolen by two prison escapees. Cadet W. E. Bayless, III - Wake County - Died February 5, 1988, while in training at the Highway Patrol Training Center. Trooper M. L. Martin - Rockingham County - Killed July 22, 1988, in a pursuit related traffic accident. Motor Carrier Officer Jackie Daniel - Mecklenburg County - Killed July 28, 1994, struck by a commercial vehicle while assisting a stranded motorist. Motor Carrier Officer F. D. Perritte - Cumberland County - Killed February 14, 1995, in a pursuit related traffic accident. Trooper D. C. Roberts - Cumberland County - Died August 8, 1996, as a result of a traffic accident. Trooper William J. Starling - Wilkes County, Killed July 20, 1998 as a result of a traffic accident. Trooper David H. Dees- Pasquotank County, Killed April 4, 1999 as a result of a traffic accident. Trooper William B. Davis- Guilford County, Killed October 21, 1999 as a result of a traffic accident that occurred while responding to assist another trooper to execute a felony vehicle stop of a suspected stolen vehicle. Trooper John H. Duncan- Cumberland County, Killed January 9, 2001 as a result of a traffic accident that occurred while pursuing a person who had been stopped for speeding and subsequently fled from the scene. Trooper Calvin E. Taylor- Haywood County, Killed October 3, 2001 as a result of an accident that occurred during a traffic stop. Trooper Anthony Greg Cogdill- Haywood County, Killed on Friday, 30 May 2003, in an automobile accident on I-40 in the performance of his duties. Trooper Joseph W. Oliver- Anson County, Died March 24, 2004 as a result of a traffic collision. Trooper D. Shawn Blanton, Jr.- Haywood County, Killed June 17, 2008 by gunshot wounds after stopping a vehicle for a traffic violation. Trooper A. J. Stocks - Wake County, Died September 9, 2008 in a traffic collision. Trooper K. P. Barber- Wilkes County, Died May 19, 2009 as a result of a traffic collision. Trooper Bobby Gene DeMuth - Edgecombe County, Killed September 8, 2012 while putting out stop sticks to stop a robbery and kidnapping suspect in a police chase. Trooper Brandon C. Peterson - Yancey County, Died April 7, 2017 due to a cardiac related event. Trooper Samuel N. Bullard - Yadkin County, Died May 21, 2018 in a pursuit related traffic accident. 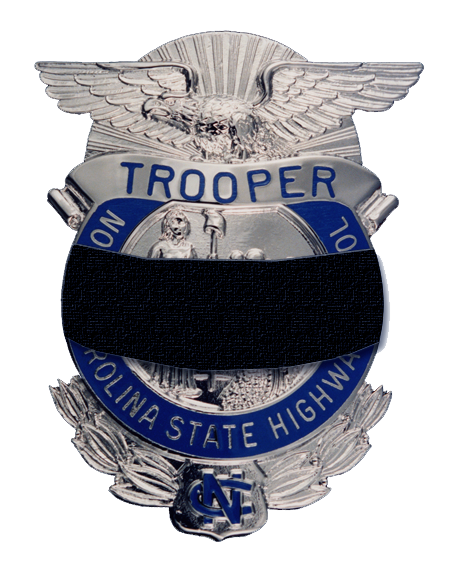 Trooper Kevin K. Conner - Columbus County, Died October 17, 2018 as a result of gunshot wounds inflicted by an occupant of a vehicle he had stopped for speeding. Trooper Benjamin D. Wallace - Pender County, Died November 2, 2018 due to a cardiac related event.